And just like that, we approach the mid-point of the year. I’ve cared for and put away my flannels and tweeds for the season, and look to fabrics better suited for warm weather. This month’s What I Wore post will feature a few new pieces that I’m excited to share. May is always a great month – longer hours of daylight, warm days, cool nights. You might recall this sport coat from my Spring/Summer Wants post. There’s a lot to love about it. Spier & Mackay have nailed the Neapolitan cut this iteration. All the little fit issues I had with previous ones – front/back balance and the shoulder area. Look for a post soon that will compare the three different versions of the Neapolitan cut. 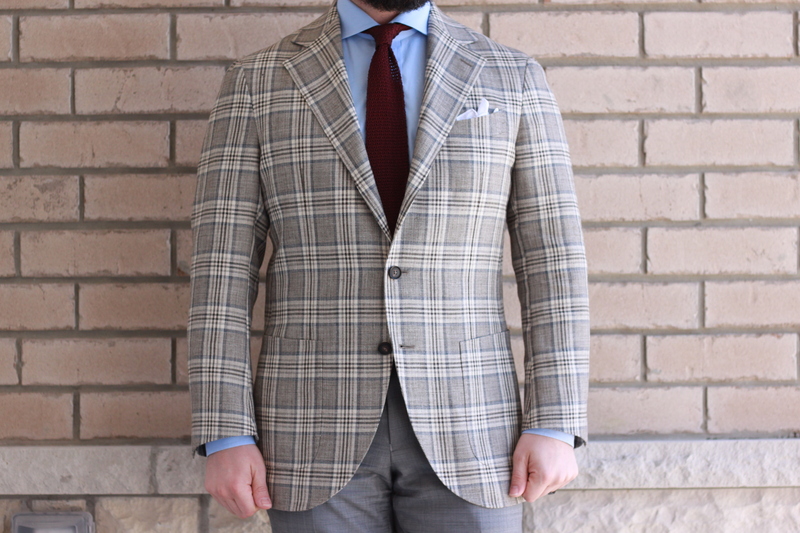 This sport coat is made up in a beautiful checked fabric that is a wool/silk/linen composition from E. Thomas. The base colour is a taupe – think oatmeal and grey, and features brown and greyish-blue in the check. Wearing this for the first time, I took inspiration from a suggestion @bluebrownandgrey made in the Spier & Mackay thread over on StyleForum. I paired it with my light grey sharkskin trousers, sharp blue poplin shirt, and my burgundy crunchy silk knit tie from Oxford Rowe. Finishing off the look I wore my Velasca suede loafers, and a plain white pocket square. 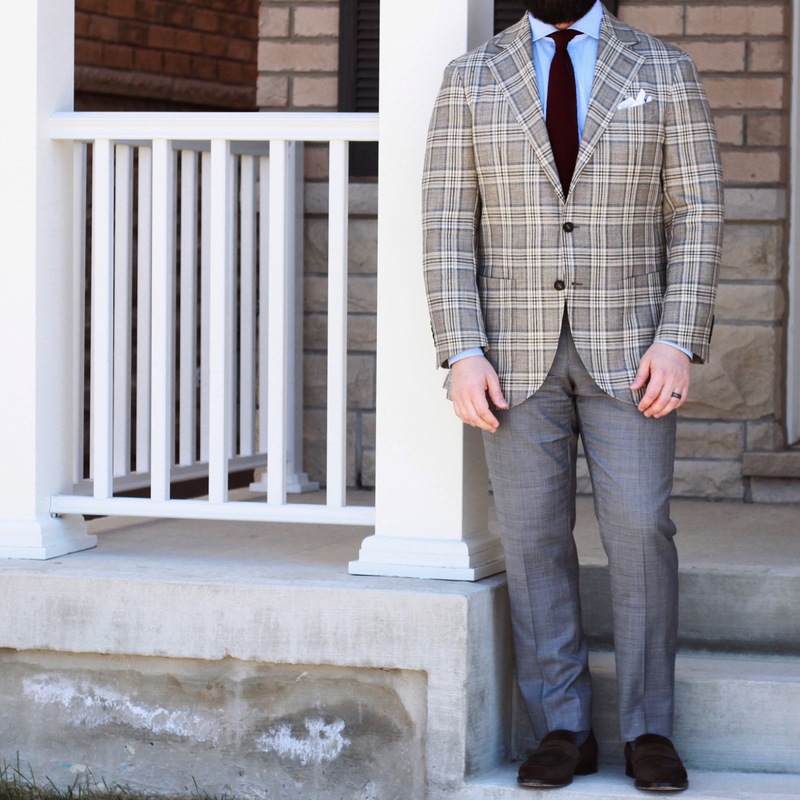 I think this look worked well – the boldness of the burgundy knit in an otherwise neutral coloured palette helped balance out the boldness of the checked sport coat. At least, in my mind it did. You might be noticing a pattern here. A pattern of patterns. Sartorial puns are the best. 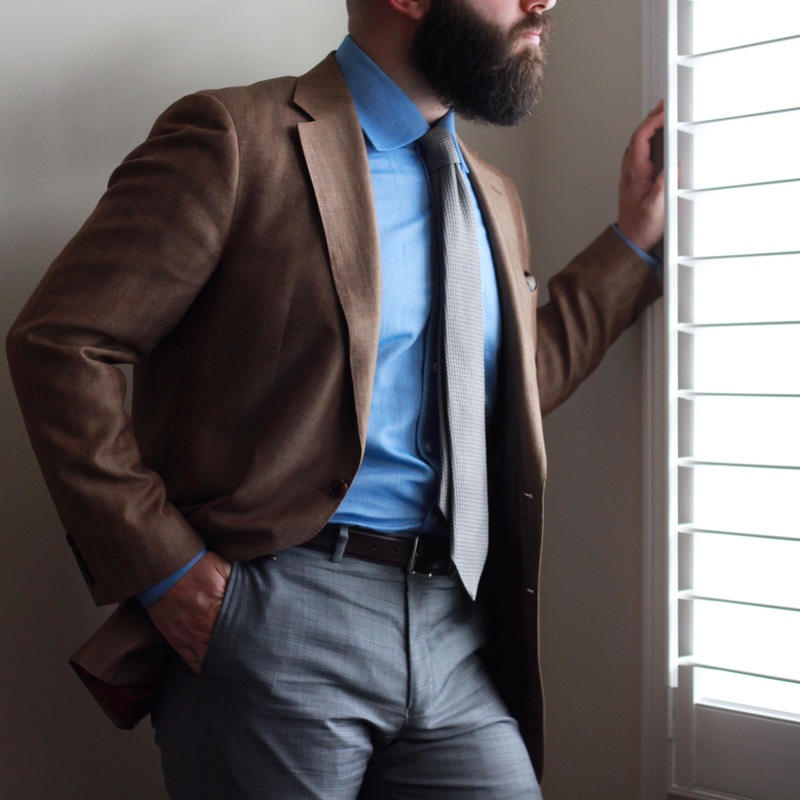 My second new sport coat, also featured in my Spring/Summer Wants post is this rusty gem. Another great wool/silk/linen blend from E. Thomas, made up in the Neapolitan v3 cut from Spier & Mackay. The ruddy brown is tempered by threads of beige that run through it, and some contrast is offered by the blue check. Here, I wore it with my mid-grey sharkskin trousers, my blue houndstooth shirt, navy grenadine from Kent Wang. In my pocket is an indigo patchwork pocket square from General Knot & Co. that I received from my sister as a Christmas present. 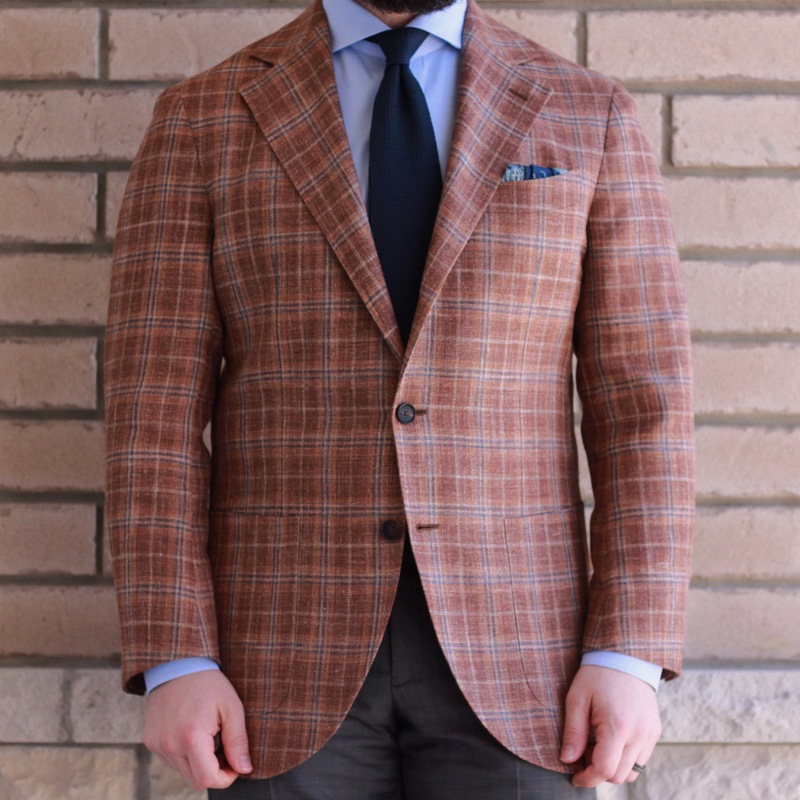 I love the jacket – I mentioned the fit improvements with this v3 Neapolitan cut. The pattern and colours are great. When looking at it before purchasing, I was pretty confident in my ability to pair it well. Now that it is hanging in my closet… I wish I had some additional options for trousers. I think an off-white would work well, as would a natural, wheat-like colour, and finally a lighter blue. This is a new favourite pose. I really like the contrast, the lighting and shadows. It’s a bit tricky for showing off a full outfit, but it’s definitely visually interesting. 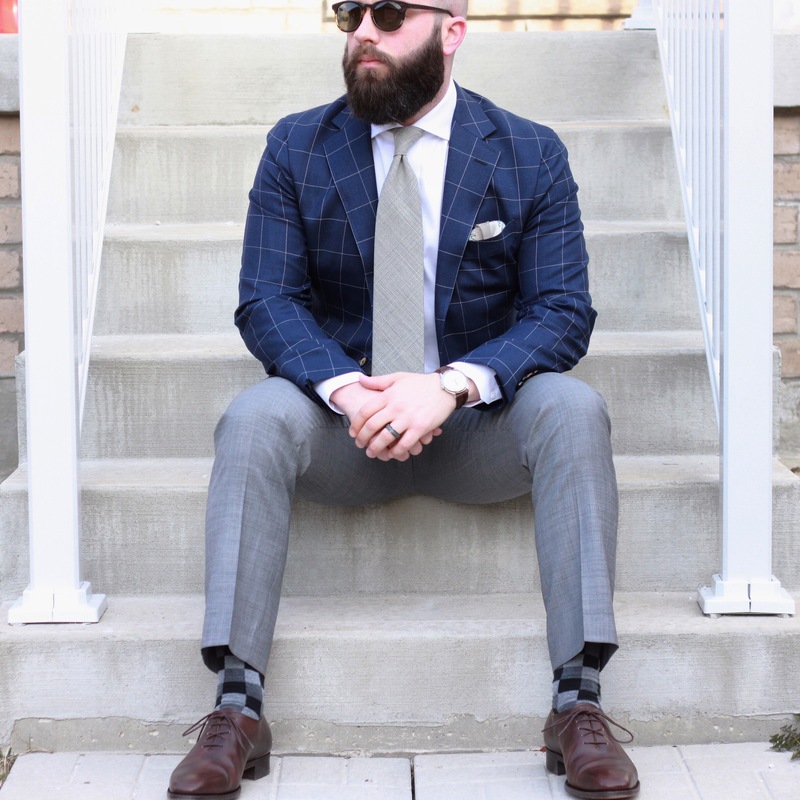 I may have to do a posing/photography part II post… This was a low contrast look overall, with my tan herringbone sport coat, chambray shirt, light grey sharkskin trousers making up the base of the outfit. For accessories, I went with my silver-grey grenadine tie and Great Wave pocket square from Kent Wang. A slightly darker tie might have been a little bit more balanced, but I’m happy with how this turned out. When I started putting together this outfit, it was around the desire to wear this jacket (part of a suit). I hadn’t worn it in a while – I sometimes forget about the suits in my closet, as I much more frequently wear sport coat and odd trouser combinations. The details of the suit jacket lend itself to be worn without the matching trousers. Unstructured, unlined and featuring patch pockets at the hips. Now, the fabric is worsted, and definitely suit-y in feel. I think the boldness of the windowpane allows it to work, for variety’s sake if nothing else. I wanted to keep it simple and play with grey and blue. Light grey sharkskin trousers, a white dress shirt, light grey PoW tie and my Great Wave pocket square, folded to show the grey, blue and white parts. The socks are bold, and probably a bit distracting in this photo. They were in my drawer and clean, so they’re what I wore. I also wore a couple of other items from Kent Wang: my wholecut dress shoes and my dark horn keyhole sunglasses. I’m a fan of blue, brown and grey together. Though it may be easy to spot that this jacket is part of a suit, I liked this outfit, and would wear it (or a variation on it) again. And just like that, May is done. What are you looking forward to in June?